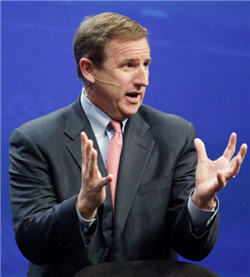 HP's CEO Mark Hurd spoke today at the Bank of America Merrill Lynch Technology conference and his words may bode ill for those hoping HP will help catapult Palm and webOS back into the thick of the smartphone battle. We assume that by 'not resonating well' Hurd simply means that the message he's trying to get across isn't being heard. That message: HP seems most interested in using webOS on 'tens of millions of HP small form factor web-connnected devices.' That confirmed what we already knew, that HP is thinking 'bigger' about what kinds of devices they want to use webOS on. We are also confident that HP's love affair with the idea of putting webOS on a tablet will happen. But this sudden disdain for smartphones gives us some serious pause - 'cause smartphones are what we love and giving that market short-shrift hardly seems like doubling-down on webOS. No need to panic just yet, webOS-faithful, but it's starting to look like HP doesn't share our conviction that a decent foothold in the smartphone space is a prerequisite for building the developer and platform ecosystem necessary to make any mobile OS a success. Maybe the reason Hurd's message isn't 'resonating' is because the idea of HP abandoning webOS smartphones is so off-key that people don't want to hear it? Source: Between the Lines on ZDNet, thanks to Bob for the tip!